Puppies need to learn some important skills, including comfort with handling, appropriate play and good manners to become an adorable senior dog. After your new puppy has arrived at your home and is starting to settle into family life, it’s time for your puppy and the entire family to attend a puppy socialization program. You’ll learn techniques to motivate your puppy in a positive way and you’ll learn about activities to encourage your puppy’s confidence – and yours too! 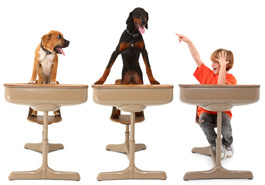 Class meets once a week for four weeks for 1-1/2 hours at Ellerslie Vet Clinic. Please call (09) 281 3 481 for class dates and times. Class size is limited and class openings are filled as registration is received. We encourage puppies, their families and friends to attend. At the time of the first class, puppies must be at least 7 weeks of age and have received their first set of vaccinations along with a health check. Your Puppy must have had at least the first puppy vaccinations, ideally a Bordetella vaccination (Kennel Cough vaccination) and a flea and worm treatment.